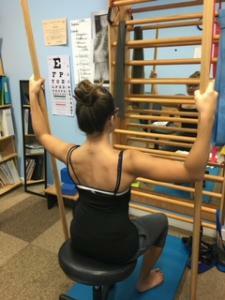 Body in Balance offers Schroth based 3-Dimensional scoliosis specific exercises. Using the Scoliosis Therapy at Body In Balance, patients can expect to: stop curve progression, decrease pain, increase vital capacity, increase muscle activation, and improve posture and balance. Without treatment, these pain points could worsen and leave you feeling further discomfort. Our therapists will create an individualized and targeted treatment program to restore normal balance by guiding you through muscle strengthening and stretching exercises. The word scoliosis comes from the Greek word meaning crooked. For the three out of every 100 people affected by it, that translates to a curvature of the back. Someone with scoliosis may have a back that curves like an “s” or a “c” and it may or may not be noticeable to others. While small curves generally do not cause problems, larger curves can cause discomfort. In some cases, the curves get worse as people grow and they may need a brace or an operation to correct it. 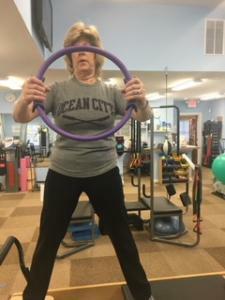 Eleanor Hagan leads the Scoliosis Therapy at Body In Balance in Linwood, NJ. She is a certified Schroth Therapist (Schroth-BSPTS Institute C2 Therapist) and has made Schroth therapy an important part of her work as a medical professional. Call 609-365-8499 or send us a message here for more information on Scoliosis Therapy at Body In Balance!